Before you intend to buy the machine that plastic into oil machine, the most important thing is that you have to choose a professional waste plastic to oil machine manufacturer. Henan Doing produced plastic to oil machine adopts the latest pyrolysis technology, which can convert plastic waste into fuel oil, carbon black, some combustible gas. 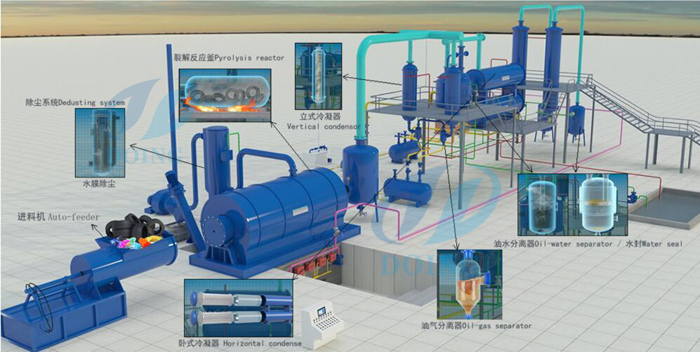 Plastic to oil machine process waste plastic to oil First of all, waste plastic needs to be broken and dried; Then pretreated waste plastic will be conveyed to the moving horizontal plastic pyrolysis reactor through feeder system, it starts to pyrolysis and oil gas will be generated when temperature up to 500 degrees. 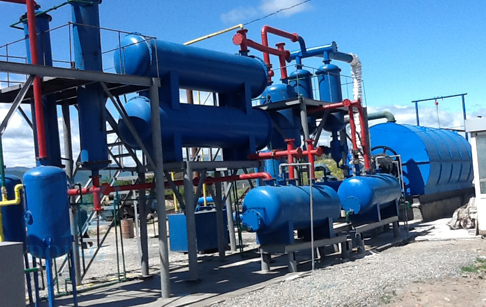 Then the oil gas will be cooling down by spray cooling system, it would be liquefied, go into the oil tank. And at the same time, some un-condensed gas comes into hot air circulation heating system by secondary fire retardant damper, it will be recycled for heating reactor as gas material. Exhaust gas will go to the strong spray de-dusting system for removing pollution, then let environmental gas go to the air. The pyrolysis slag emissions and recycled through second sealed discharging system. 1, Safety Design The plastic into oil machine for sale is equipped with mature safety devices, such as thermometer, pressure gauge, safety valve, electric control system. Hydroseal and Vacuum system will prevent exhaust gas from going back to condensers and reactor. Thus, unnecessary accident can be avoided. 2, Energy saving The extra gas that can not be liquid oil under normal pressure would be recycled to heat the reactor as fuel. The gas generated in the pyrolysis process has more caroric value, which will save a lot of energy for the whole working process. 3, Environment protection All parts are well-sealed, so air leakage can be avoided. In the dedusting system, three steps are used to dedust the hot smoke from pyrolysis reactor, which ensures the released gas is pollution-free and can be discharged into the air directly. 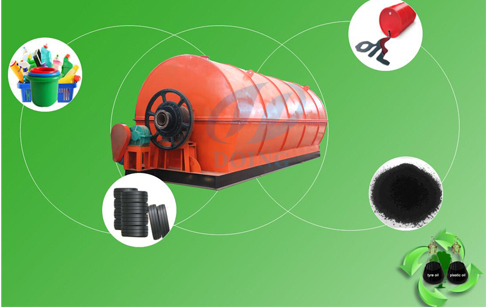 The essential product of tyre pyrolysis process is pyrolysis oil referred as fuel oil (40 to 45 % of total quantity feed) which is used as a fuel component for heating in fire chamber. 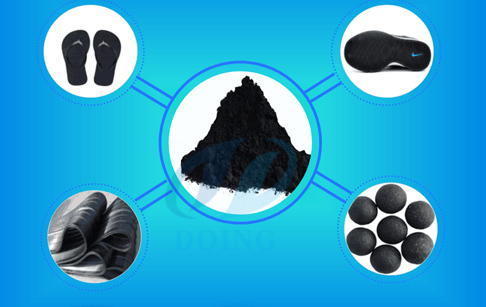 (30 to 35%) The vital product of pyrolysis plant is carbon black referred as "charcoal"(30 to 35% of total quantity feed).carbon black has Industrial and commercial use. 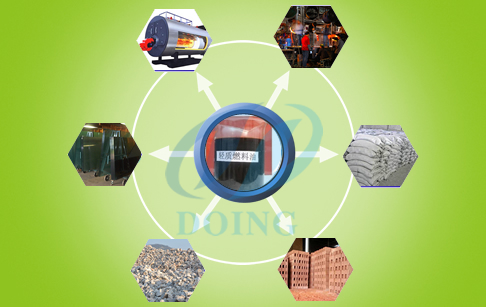 If you wanna to get more details about Plastic to oil machine you can send E-mail to market@doinggroup.com. You can consult our professional engineer and specialized sales team with leave a message in below form.We will contact with you ASAP.You also can visit our factory in Henan,China.Get Detailed address.